Demand Safer Streets in Midtown! The Midtown/Plaza Area Plan (MPAP) recommended further study and planning of several potential Complete Streets upgrades to improve safety, livability, and mobility for all. 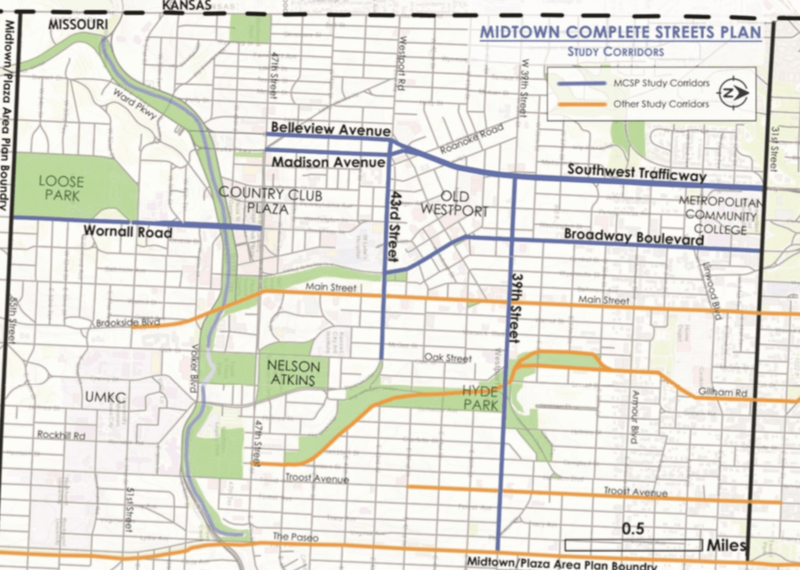 The Midtown Complete Streets Study is the first step toward implementing that recommendation. This study will gather community priorities for improvements, develop complex traffic models, and ultimately recommend design concepts. Depending on community feedback, these design concepts may include improved pedestrian space, bike lanes, improved transit amenities, and enhanced streetscape. Also a recommendation of MPAP, another study is evaluating Complete Street options for Gillham Boulevard from 27th St. to Emanuel Cleaver. Be sure to sign up for updates on this project at the bottom of the page. Click on the image to view and download the Advisory Committee presentation which includes a lot of fascinating data. Unfortunately there is some opposition to Complete Streets from members of the study’s steering committee and members of the Midtown-Plaza Area Plan Implementation Committee. Opponents have raised a variety concerns around a reluctance to make changes that might make motor vehicle traffic less of priority. There is also some unfortunate skepticism about safety data and the need to make it safer for people who walk or bike in Midtown. It is critical that Midtown residents and stakeholders speak up so that City Hall knows there is a big majority of Complete Streets supporters.